The energy that surrounds us, that we emit, and that affects us, has a huge impact on our emotional and physical health and our overall wellbeing. 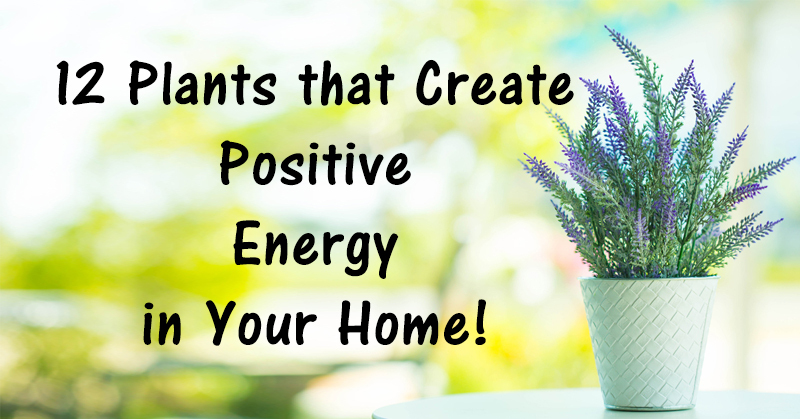 Therefore, it is of high importance to ensure a flow of pure, clean, and positive energy in the places where we spend most of our time, like our home and the office. Plants protect the life on Earth, and despite it, they have a huge importance in our lives. They are among the best natural ways to purify the air and cleanse the energy in the room and in the environment. Despite decorating the place, plants can also help us relieve stress, cleanse the air, and regain our health and happiness. They channelize the energy and direct new, strong, serene, rejuvenating energy into the home. Its pleasant fragrance improves the energy in the home and improves mood. Keep it in the bedroom, as it will cleanse the air and help you fall asleep, due to the high oxygen amounts it releases during the night. It is a symbol of honesty and purity, and it purifies the air, promotes wellbeing, and ensures longevity. This powerful plant fights negative vibes and bears good luck and positive energy. Place it in an area with indirect sunlight or artificial light and water it regularly. Its sweet smell attracts positive energy and strengthens relationships and builds romance. In the room, make sure you place it near a south-facing window. Rosemary cleanses the air from harmful toxins, while its smell boosts mood, treats anxiety and fatigue, improves memory, and fights insomnia. It improves the energy flow by cleansing the air and eliminating harmful gases. It brings about spiritual, mental, and physical prosperity, and will create a calm atmosphere, ideal for sleep. Feng Sui maintains that its vertical shape represents the element wood, which affects our life energy, vitality, and physical activity. It is low-maintenance, so keep it in the corner, away from direct sunlight, in a glass bowl with about 1 inch of distilled or purified water. It cleanses the air from negative energy and emotions like fear and anger and creates a peaceful, relaxed atmosphere. It is one of the most powerful air purifiers and creates a stress-free, calm, positive atmosphere. It creates positive energy that attracts fortune and good luck while reducing stress, negativity, and anxiety. Keep it in front of a sharp corner or angle in the room. It eliminates toxins from the air and cleanses the living environment while ensuring a constant flow or calm, positive energy. It is believed to have powerful healing properties, clears the air of negative energy and attracts positive vibrations to the environment. It releases oxygen 20 hours daily while absorbing dangerous toxins from the environment. Keep it in a sunny place in a north, east or northeast area of the home or garden.